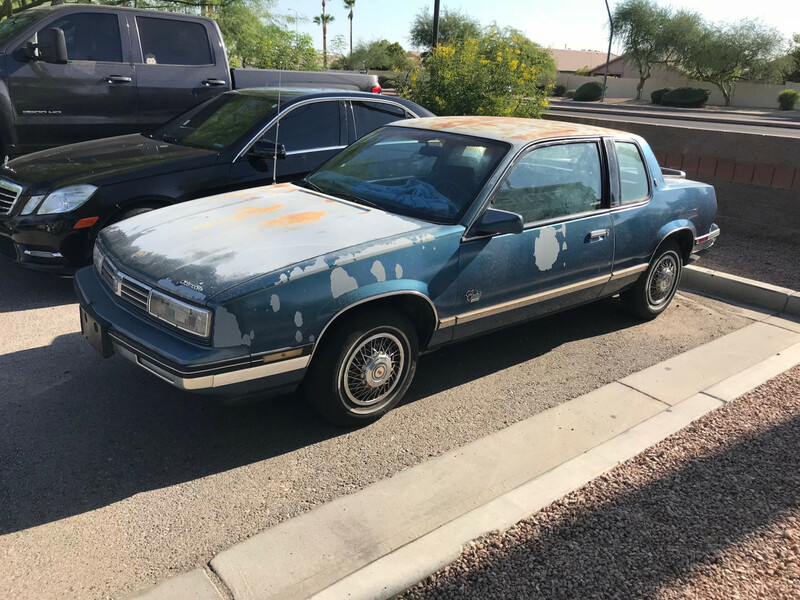 Although the mythical “California car” has become a staple in almost every old car scene, the retirees of suburban Phoenix, Arizona, have done more than their fair share to keep the workhorses of the 80s on the road. Sure, no car stereotype is entirely true–I’m sure people from many different walks of life were stumbling into Oldsmobile dealerships in 1987–but we have the elderly to thank for many of the old survivors still on the road. And although Oldsmobile’s brand image hadn’t quite fallen into joke territory when this Calais Supreme was new, there was still a growing disconnect between what the upwardly mobile shoppers of the late-eighties were looking for and what General Motors’ innovation division had to offer. This wasn’t an old person’s car at all, just a bargain hunter’s–or anyone else willing to overlook the quickly peeling facade. The flaws of the new-for-1985 N-Body have been well documented, both on CC and elsewhere, so suffice it to say that the circumstances were all rather unfortunate. A compact, upscale coupe with sporting pretensions and front-wheel drive. Wasn’t that the winning formula for so many darlings of the decade? General Motors certainly thought so, going as far as to develop the N-Body as a replacement for the mid-size, rear-drive G-Body. Of course, that never came to pass, as falling gas prices meant the platform’s raison d’etre had to be switched around. Thankfully, some brilliant market analysts thought to use these shrunken compacts to replace the disastrous, yet groundbreaking, X-Bodies. At least that hints to why the sedans bowed a year late and looked even more ill-proportioned than their stubby coupe counterparts: it was a rush job, of course. At least General Motors is still keeping us busy thinking of all the alternate paths the company could take, even decades after the fact. “But what if” has become a common thread in my musings about both this car and its siblings, the Pontiac Grand Am and Buick Somerset Regal. All were perfectly capable cars up to a point, but their design and execution leaves lots of room for rhetorical questions–namely, what if they were better? 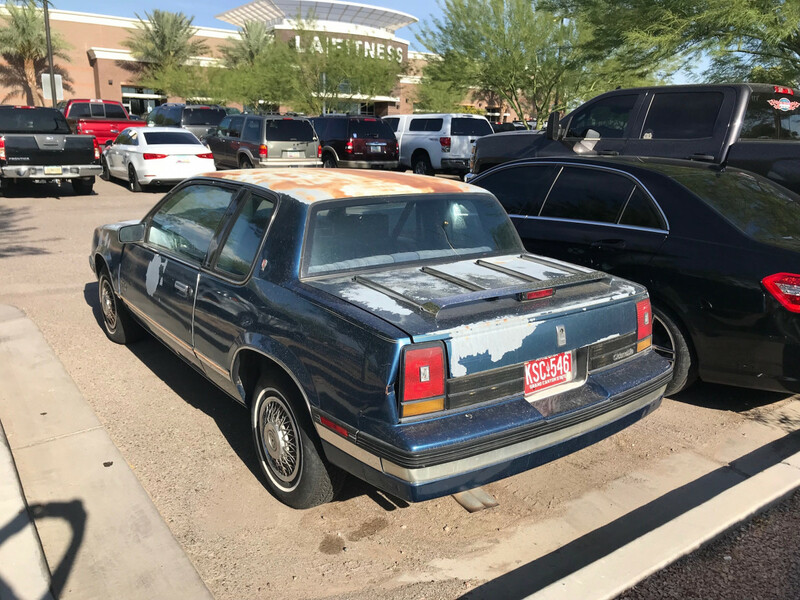 This poor car has certainly avoided many of the common N-Body woes, with its normally brittle plastic lower body cladding holding up quite nicely against the desert sun. And, of course, whatever mill is resting under the weathered hood has likely been treated well–or is that more had at this point? It’s been hypothesized here before that the yuppies on a budget who bought these cars new didn’t exactly give them the same love and care that their parents would bestow upon A-Bodies of a similar age, making survivor N-Bodies like this one scarce on the ground indeed. But, then again, I’ve seen my fair share of octogenarians puttering down the street in an N-Body of this vintage–in fact, I think one was a Calais sedan in the same paint color. 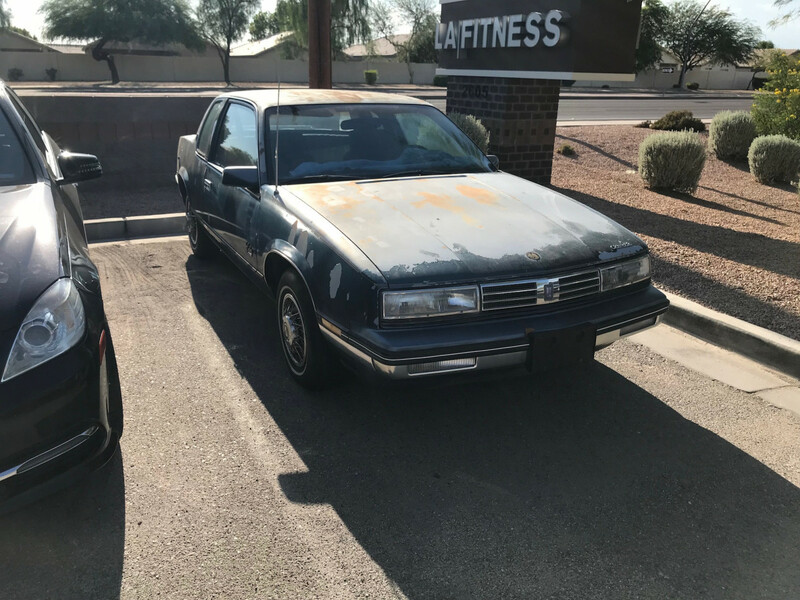 You can certainly sell a young(er) person’s car to an old person, and I’ll hazard a guess that that’s what kept many local Phoenix Oldsmobile dealers in business. I know it’s a fool’s errand to make guesses about the original owner of any car, much less one that tried to appeal to so many different people at once. I would have loved to stick around to meet this car’s current caretaker (along with taking the time to get better pictures), but I had a restless brother waiting who didn’t share my shock and awe at seeing a Calais Supreme on the road. Likewise, I didn’t quite feel comfortable putting my camera up against the window to take a picture of the interior in the middle of a crowded parking lot, but it looked nicely preserved in a deep, rich blue: much more durable than the rapidly fading paint. How could the fragile interior and brittle body cladding both stay fairly intact while the finish disintegrated? Was it a bad batch of clear coat? One of GM’s paint robots having a conniption fit? Wildcat strike? Alien abduction? I am not ashamed of the fact that I love Oldsmobiles. In fact, I try my best to document every Olds still on the road: like recording the last known examples of a species on the verge of extinction. So, when I saw this 1987 Calais Supreme sitting among the F-150 Platinums and Camry XLEs at my local LA Fitness, I had to stop and take a closer look. But as I circled around and saw the missing paint and the spots of rust, all I could muster up was pity for this tired old machine. The Calais, like its N-Body siblings, had so much potential. The success of other premium compacts at the time makes it clear that these cars’ poor performance, on both the road and the sales charts, was not a forgone conclusion by any means. The success of the Acura Integra shows that there was a market for exactly this type of vehicle. Could you imagine a world where, spotting a niche to be filled in the FWD premium compact market, General Motors designed the N-Cars to appeal to the type of buyer that Acura–and, to a lesser extent, Audi–so successfully wooed? And what on Earth were they planning as replacements for the G-Body sedans that were still soldiering on? I’m sure the engineering department at GM could have started out with similar goals if they were prescient enough to notice the gap–but here I go again with the what-ifs and the guessing games. Of course, nothing was quite this straightforward when the N platform was being developed, and I’m sure every choice GM made was justified by mountains of memos and research. Or am I giving them too much credit? Poor General Motors, still being torn apart for the N-Bodies thirty years later. Of course, their underpinnings, despite being born out of desperation, soldiered on until 2005. Now that’s unfortunate. But I was feeling fairly torn apart myself at the time, trying to figure out what on Earth to write up as a first submission. Should I keep it simple and write a “My Curbside Classic” piece? I certainly couldn’t take the easy way out; that’s what got the half-baked coupes out the door in the first place. And then I laid eyes on this mini-me Calais–a Supreme, no less–and the tragic story of the N-Body played out in front of me. It looks like these cars were good for something after all. Either way, I didn’t feel like sticking around for the owner, especially not when I heard the owner of the Mercedes parked right next to this Olds walking over. There’s no way I’d be able to talk my way out of that situation. “You’re scoping out that heap and not my car? Likely story.” I’m sure whoever took this car out to the gym today is quite the character: certainly not your usual suburban LA Fitness fare. Was this Calais the Audi Q3 of its day, bought new with the hopes of impressing local gym buddies or fellow PTA members? Is there any modern comparison to the N-Body out there at all? Maybe I’m not giving this car enough credit. You can’t choose your parents, after all. And this Olds seems to be doing quite nicely; despite its unfortunate circumstances, it still looks right at home in a suburban parking lot. I hope whoever owns this car today doesn’t let it succumb to the same maladies that sent its platform mates to their early graves. What does it feel like to soldier on as so many of your siblings drop like flies? Quite the tortured soul indeed. Great first article, man! And there can’t be too many of these early Calais models still on the road. Pontiac seemed to do a much better job of appealing to young buyers with its N-Body while Buick’s Somerset Regal and Skylark had all the classic and senior-friendly Buick design cues. So just who was buying these Calais? Oldsmobile lost so much market share during the 1980s… They should have just picked a theme and stuck with it instead of being all things to all people. Imagine if they’d released a coherent lineup of import fighters like the Intrigue, Alero and Aurora in the 1980s? No bench seats, no wire wheel covers, no vinyl roofs. Alas, they still would have had the obstacle of GM’s research, development and design process to overcome. 1) A math teacher in her late 20’s at my high school had a Calais two door, in the same color as the featured car. Nice of you to call it a color. At the time that the N bodies were introduced, both Buick and Olds outsold Pontiac. I was going along the lines that the smallish sporty coupe (and shoehorned-in sedan) was more Pontiac’s “turf” if combined distribution took care of all the dealers clamoring to be in every segment. GM tried. Pontiac’s dealers didn’t want any part of that. They went bugnuts crazy when they lost the B body. Ironically, Pontiac sales stayed level through the 80s and 90s at around half a million. Both Buick and Olds went from a million-plus to the low hundred thousands. Oldsmobile outsold Buick most years until the announcement in 2000 of the termination of the brand. Buick didn’t have a secret sauce. The brand that should have been fighting imports in the early 80s was Chevrolet. It lost about half its volume when other GM brands had near record sales. Once those young customers left GM, they didn’t come back, and their siblings and peers followed them. The Intrgue and Alero were a step behind import brands (esp the Alero), so it’s hard to see how they would have fared differently ten years earlier. The problem was that Oldsmobile’s sales didn’t budge much despite the division offering several revamped models, and using the expensive Northstar-based V-6 in the Intrigue and V-8 in the Aurora. Buick offered older models with the tried-and-true – and inexpensive – 3.8 V-6. Given those factors, most likely Buick was turning a profit, or at least breaking even, while Oldsmobile was not. If import prospects had bought the upgraded Oldsmobiles instead of import brands, the extra content would have been worth the cost. They didn’t, so it wasn’t. The actual buyers were mostly from the same (shrinking) pool of GM customers. At that point, GM clearly had too many mid market brands and dealers and decided that the Olds brand and dealer body were least needed; Pontiac and Buick would cover that spread of the market, which was mostly diehard GM loyalists, fine without Olds. While Buick loyalists probably would have switched to Olds, Buick dealers had a better reputation in their communities with older buyers. Olds dealers had expanded rapidly in the Cutlass era to match the older Buick network. I have to ask where in Phoenix you happen to be. That LA Fitness looks awfully similar to one I’ve walked by when picking up my car from the local Firestone numerous times, it’s about a three minute walk from the apartment complex I’m in while I go to school. Say what you will about these Oldsmobiles, they are nothing if not unkillable. Outside of some late 90s and a couple 80s Cutlass Supremes, these are the only cars sporting the rocket logo I see. They may not always be in the best shape, but they always soldier on for better or worse, and I admire a car like that even if it’s not my thing. I actually owned the Pontiac version of these cars. A 1990 Grand Am sedan. I guess it was somewhat well-equipped: cassette player, power windows and locks, A/C. It was $15,000. One thing I always thought was funny was the fact that you could get an $895 Delco/Bose stereo system in the Buick and Olds versions. How many of these rolled off the assembly line with an almost $1,000 stereo in the dash? By 1990, most Calais and Skylarks were base models. The J bodies had been dropped, so these were the cheapest cars at your Olds or Buick dealer. Yeah, I doubt there were many Calais with crank windows, steel wheels, and thousand dollar radios. For some reason when i look at these Olds i see a 1964 Mustang maybe it’s the tailights but i remember when i first saw this Olds,thats the first thought that entered my mind. Would love to find one in good shape as in todays day and age of look a like cars this really stands out as a breath of fresh air. Great first write up!!! Congrats on your first post! 😀 I too have a habit of documenting every Plymouth still on the road, if not every vintage Chrysler l see. Folks don’t seem to understand what we car enthusiasts love. It’s not big engines or flashy cars, it’s about the love we share for automotive endeavors, the triumphs and pratfalls that make up the rich canvas of our passion. Good on you for giving this Olds it’s day in the sun. I look forward to reading more from you. A cousin bought one of these and I got a short ride in it not long after she took delivery. She had been through a difficult stretch of life and this car was a signal that life was settling down. I tried to imagine myself in one but simply could not. At the time I thought it was just me – after all these were selling pretty well in the midwest. But it turned out not to be just me. I had no idea at the time that GM was at the beginning of a long, slow death spiral. A very nice introductory CC, by the way – much stonger than my first (cringeworthy) effort. I would take a Dodge Omni in a heartbeat over this GM POS. My memories of 80’s N-bodies comes from the mid-90’s, when I’d bought my first BMW. A 1990 328is coupe. Any Friday night I’d take it out, I’d invariably run into some teenager with a 8-10 year old Grand Am, wanting to race. That’s what these cars were to me: A blue collar ride for kids with delusions of BMW. And in the Johnstown area the Grand Ams way outnumbered the Calais and Somersets combined. Because they aped a BMW. No 328is in 1990. Was it a different model year or different model? Congratulations on a first post! It was enjoyable and about a car that deserves all the positive attention it can get. About Mercedes guy….you could have told him you were intrigued with his originality in choosing black for his car, as you’ve never seen another black one. He likely would not have realized seemingly every surviving GM N-body is this color of blue. I have a 1990 oldsmobile still on the road 170.032 miles still strong. Great piece! I myself still struggle to make sense of these cars, and I also share your feelings of pity for them. As others have said above, a lot can be attributed to the fact that GM tried to market them to to many specific demographics, in the process alienating them all. Trying to sell a sporty model with body cladding of the same car that also comes with wire wheels probably left a sour taste in the mouths of many. Personally, the fact that GM kept the ultra vertical “formal” roofline was also a hinderance to these cars, especially given their small size. The sloped rooflines of the Taurus and many imports were the wave of the future, complete with far more sleeker noses and other styling elements. The N-bodies by comparison just looked old and stodgy. All of that. And if a prospect made it to a test drive, perhaps after the Integra with all its’ ’80s Honda-ness, there was an Iron Duke and cable-operated shift linkage waiting inside the GMs that was more at home in a postal LLV than a premium sporty compact. I’ll never forget the center console on these when they first came out: A separate storage box was perched on top of the console, hinged at the rear to allow the parking brake handle to be raised. It’s almost as though it was an afterthought, or a way to delete the center storage and armrest on lower trim levels. Here’s a photo from the 1985 brochure, where you can see how the weird console storage box worked (or didn’t). Looks like that was a one-year thing, because it appears to have been redesigned from the looks of the interior photos in the 1986 brochure. Speaking of brochures, another oddity of these is that the 1985 Calais appeared in the brochure for compact Oldsmobiles, and the following year it was in the midsize brochure. To fully appreciate the inanity of this design you need to personally experience pulling up and setting the parking brake lever, and having the front of the armrest get pushed up to make way for the brake lever. It was really like each of those two parts was designed without knowing the other was going to be there. 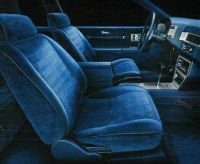 The ’85 Somerset Regal had a first year oddity too (and not just the one-year-only name) – a vertically standing cassette player and some sound controls perched atop the front of the center console that could be swiveled to the left or right for an easier reach for the driver and front passenger respectively. Needless to say, you were screwed if you wanted an aftermarket replacement. I think the woodgrain may have been ’85 only too and only in the Limited models. Maybe one of these survived into ’86, but but no longer. I knew a guy who got a low milage one of these as a hand me down from an older family member. He drove the hell out of it for one summer, not washing or fixing it up as paint and parts started falling off. In that one summer, it went from nearly mint condition time capsule to beater status. I never quite understood these cars – like the Tempo/Topaz twins, they were larger than a compact but smaller than a midsize car. These GM models, compared to what the Japanese OEMs were selling just seemed chunky and rather crude to me – I did check these out back then. Of course, the GM halfway down back window glass mentality turned me off, to! What else is new, it’s me! Nope – you can keep and bury these. We drove K-cars back then, and even they seemed so much better, but who knows? I was still mad at GM then and for a long time thereafter, so my judgment was clouded. It was mentioned in the article that they were meant to replace the RWD G-bodies and pushed into a lower segment when gas started getting cheap and GM started (dusted off?) the GM10 program to replace the G’s. If it’s indeed true that the four-doors were afterthoughts that would explain the halfway-opening rear windows; they did the best they could without a total rethink that would add years and billions to the program, but with the formal roof these looked better to me as four-doors so I’m not sure about the afterthought thing now that I think about it. I was a car-obsessed teen in 1986, especially interested in Preludes Si’s, Celica Gt-S’s and VW GTIs. It never occurred to me that the Calais was even in the same class. I know GM offered some sporty versions of the N bodies but come on. Could you imagine a factory 1987 Celica with wire wheels and a vinyl roof? On the other hand a buddy had a first gen Z24 notchback. It wasn’t as slick as my GT-S but that thing was plenty quick and, I thought, very good-looking in a muscle-car way. I graduated high school in 1986. A classmate and friend who’d just started her first “real job” doing something clerical and taking college classes evenings and Saturdays was immensely proud of her first new car, bought with some down payment assistance and co-signature help from her Dad. It was a 1987 Buick Somerset coupe, with all the 80’s trappings, like digital dash, power everything, upgraded Delco stereo system with a weird “pod-like” head unit that sat atop the front edge of the center console (it may have been on some kind of a pivoting contraption too). And yes, I distinctly recall riding in it and wondering “why?”. In those years Preludes, Integras, 200SX’s, Corolla coupes, etc. were everywhere and were head-and-shoulders above these things. I have to imagine that her very well equipped N-Body must have stickered in the same range as any of the above. Thinking back I still wonder whether her father pressed her into a domestic car or whether the “whiz-bang factor” of all that digital wonderment swayed her decision. In any event, even then the choice seemed really bizarre to me when there were so many other clear winners available. I don’t think she kept the car for the full term of the original loan. I can’t speak for the durability of the drivetrain, but it was clear from day one that the Fisher Price interior and tacked on accouterments were going to have a short shelf-life. Looking for a pic of that oddball radio pod, I came across this TTAC writeup by Murilee Martin. What more is there really to say about these? 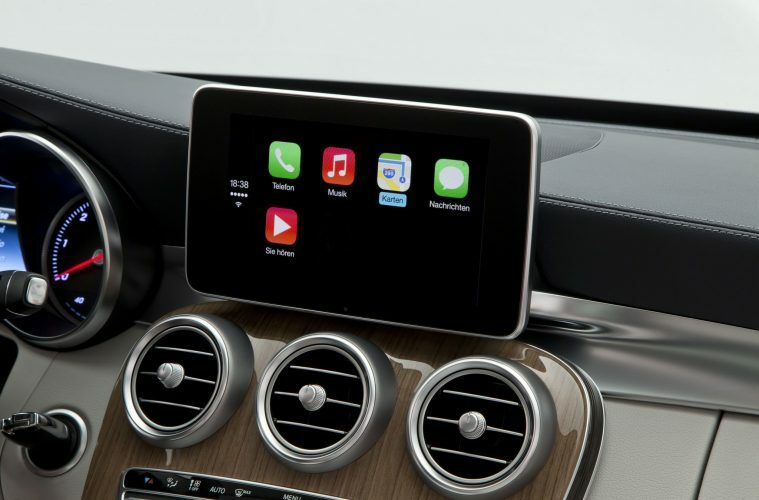 That oddball radio looks like it was styled to fit in with the look of the rest of the instrument panel. But I have to say that that interior is one of the strangest that I have seen in a small car. I will never understand why GM could never figure out that folks looking to buy a small/smaller car don’t necessarily want a shrunken down version of a bigger car….in this case a Riviera(?). They were 30 years ahead of their time…. N body was meant to replace the formal roof G body, and to get trade ins of those. So, had “traditional” styling cues. But, older people wanted older looks, and younger folks wanted modern designs. The Skylark got the seniors, and Grand Am got the Yuppies. Calais? Not too many buyers at all. The Oldsmobile brand was more popular than Buick every year that the Calais was in production. 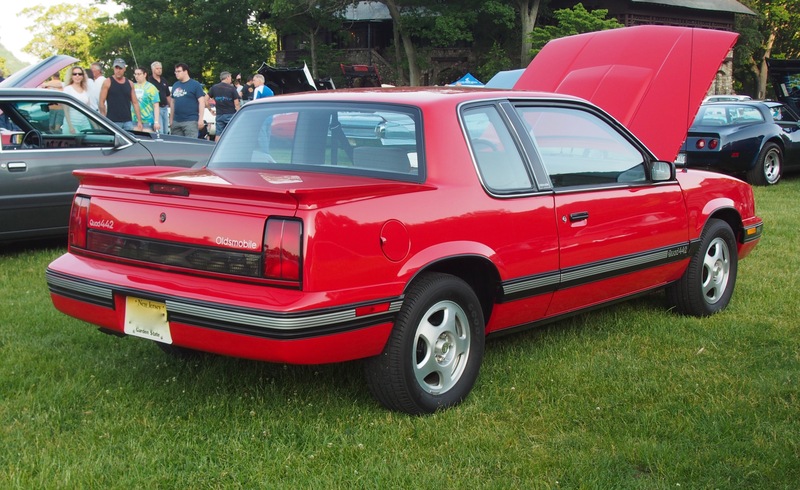 The “Cutlass” Calais started out a little more popular than the Somerset, then they were about even. The Buick models that outsold the corresponding Olds were the biggest models. That’s where Buick actually had an advantage with its brand appeal to older buyers and its more traditional detailing. Like I alluded to in my post below, I think the issue with Olds is that they went after both by throwing the kitcshy Supreme package on it, turning off everyone. Was the Grand Am styling really that much more youthful, or was it just the kidney beans and the trim configuration that younger buyers found acceptable on the Pontiac N? The duality of 80s GM is just so infuriating, 20 years prior to these there was no keeping one foot into the past. They came out with new modern designs frequently and customers young and old bought them. GM (through the design leadership of Harley Earl and Bill Mitchell) set the trends, not the customers. To answer your question, it would not be unexpected that a young woman getting started would look to her parents for what kind of car to buy (especially if parents were helping). That was the case with my relative. And there were lots and lots of parents of the mindset of “Don’t get one of those cheap, tinny foreign cars, get a good GM car.” Oldsmoble made some great cars in 1957, 1967, 1977 – ergo the ones they made in 1987 were likely to be great too. At least that was the theory. This would be a fun car to apply a Tremclad/Rustoleum roller paint job. There’s one of these that I seen every now and then in a small town in north Florida. It’s a red 4-4-2, and surprisingly owned/driven by a gentleman in his late 60s/early 70s. It looks better than this example, with all its red paint and gold accents still in place, just a bit weathered….as you would expect from a car that has spent a lot of time here. The Chevy Beretta and Corsica weren’t great cars, but they managed to look so much better than these similar sized Oldsmobiles. I had a friend who bought a Calais with a Quad 4 in this timeframe -somewhere around 1989 or so. He was (as was I) an aspiring junior manager in a large corporation. An Olds still in those days the traditional choice for middle management, with the Quad 4 showing that you on top of the new trends and not just a drone. Olds was coming down from its peak point as America’s respectable middle class car of choice, but it was early enough in GM’s “Can’t tell the players without a scorecard” era to be considered a premium car. An Acura Integra filled the same role for me. The Calais was plusher than the rather spartan Integra, but the engine seemed out of character. In the Integra, zinging the redline seemed natural, but not so much in the Calais. I don’t recall his having any specific problems with the car, but I know that two years later it was replaced by a Maxima. As a side note, that peeling paint on the article car is not necessarily a function of age and Arizona. GM had a huge problem with paint on their cars peeling off in sheets while the cars were a year or two old during the 1980’s. It was such a pervasive problem that GM (in 1993) finally had to agree to repaint any car with paint problems that was less than six years old. I believe that Ford and Chrysler had this problem, too. Neons were the worst. After a few years on the road, the paint would peel off in sheets from Neons. Excellent piece – really captured my interest. For some reason, these cars acquired a reputation as a bit of a chick-mobile up this way, not sure why. These seemed like decent enough cars for their time. Most seniors in Sun City AZ area have late model cars/CUV’s, up to 10 years old. But a few have vintage 20-30 y/o ones. At my folks’ condo, 10-15 years ago was a mint ’91 Cutlass Calais, but parked under a shady car port. Which actually is a good question. That Olds is a survivor and I don’t think it all happened in the hands-off of most current Mercedes owners. When the 1986 N-Body four-doors came out, concurrently with the new Toronado, Riviera, Eldorado and Seville, the N-Body four-doors looked to me like a cartoon version of the Seville. The Eldorado, in particular, looked so stubby that, as was the case with the earlier fwd C-Body Cadillac, two years after introduction, GM added a few inches to the rear end (manly the bumper cover, I think) to give it a longer look. I think the styling of these N-Bodies doomed them from day one. That, coupled with the famous magazine cover of the nearly-identical Celebrity, 6000, Cutlass Ciera and Century; the Lincoln Town Car commercial mocking the new fwd C-Bodies; the “diesel debacle;” the V-8-6-4; the Chevy V-8 in the Olds 88; and poor assembly quality chronicled GM’s long, slow decline in the 1980s. By that time, the Japanese invasion (high-quality, high-content cars, now in some instances built in the U.S.) had reached critical mass, and the GM obituary was in the early stages of composition. > General Motors certainly thought so, going as far as to develop the N-Body as a replacement for the mid-size, rear-drive G-Body. GM tried at least *three* times to replace the wildly-popular G body, with the FWD A body (1982), N body (1985), and W/GM10 body) 1988. Yet none of them really appealed to people who bought RWD Cutlasses and their ilk in the ’70s and early ’80s, nor did they reach out far enough to grab the growing number of buyers eyeing sporty imports. GM’s midsize strategy in the ’80s was such a mess. In 1986, someone considering a midsize Olds coupe would find a Calais, Ciera, the not-quite-fullsized FWD Delta 88 and Ninety Eight, and shrunken-again Toronado in the showroom, though s/he would likely spurn them all in favor of the carryover G body Cutlass Supreme. Their small-car strategy was just as bad. Go into the Chevy dealer and there’d be the Suzuki-based Sprint, the ’70s holdover Chevette, the Spectrum from Isuzu, the Cavalier and the NUMMI Nova in order of increasing base MSRP. I kind of find myself appreciating these lately, I don’t know if it’s a maturity thing or the current automotive environment I’m so thoroughly alienated by, but I find some merit to what GM set out to do with the Ns, the execution was just too full of mixed messages to put them on the radar of Acura Integra type buyers. The styling for the time was solid, possibly the best of GM’s 80s formal roof designs, the problem is the details, throw those awful looking convex wire wheel covers chintzy side trim and luggage rack on either the Accord or the Integra as standard equipment and speculate whether or not they would have done as well. Is what GM needed a virtual clone of the competition? That always seems to be the hindsight answer we come up with “GM should have built duplicates of Honda’s/Toyota’s and they’d be fine”. I think the whole Calais model line should have been what became the Calais 442, standard HO QUAD 4(with better engineering), standard modern looking alloys, minimal trim, bright colors and zero brougham carryovers. The featured car may look comically out of touch with the Honda/Acura comparisons, but the 442 really doesn’t, its silhouette certainly stands apart of course, but the way a car from a different car maker should stand apart, which is the point of choice, isn’t it? GM just was too afraid to move on from the 70s though, hence why they continually couldn’t commit to cancelling the G bodies, which only complicated lineups and cemented the backward image of American cars for the public at large. Submodels like the Calais 442 got priced right into obscurity and dealers got stocked with cars trimmed up like it’s 1978, so buyers GM felt we’re loyal won’t be reminded by the passage of time, and unfortunately the Olds N body was just one example of this, Pontiac had better approach with the Grand Am and the success of it despite the roofline and quality speaks volumes. I preferred the follow-up Achieva from a styling standpoint – even the “shrunken Ninety-Eight” four-door sedan version. The Achieva coupe was a good-looking car. The problems were – again – the lack of mechanical refinement, spotty build quality and cheap interior materials. I always liked Achieva coupes, but I think a big part of of the reason for that is that they never were outfitted with ugly wire wheel covers or slatherings of plastichrome at every edge like Calais. A regular Achieva was trimmed more like the Quad 442 predecessor, with minimal trim and modern alloy wheels. Except for the ding by the left taillamp, it’s still straight as an arrow. 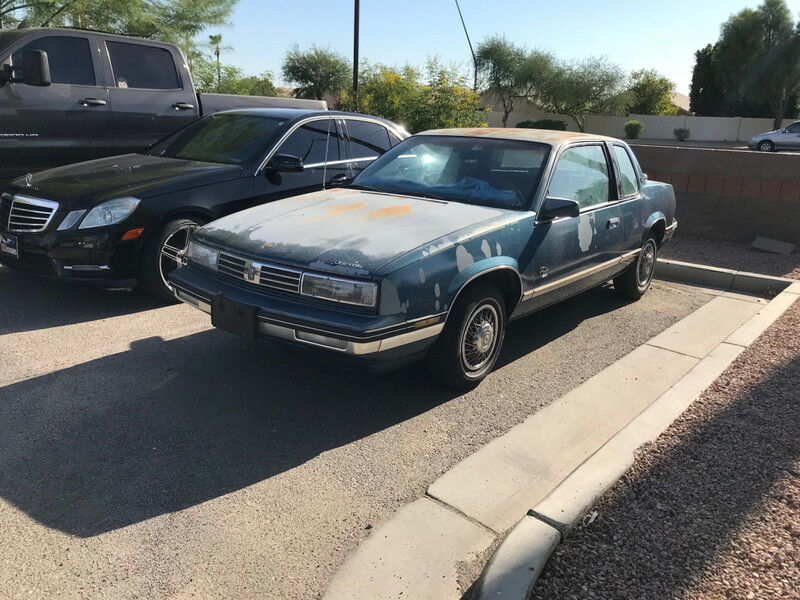 Had a ’79 Caballero (El Camino) in a light blue, paint was about as bad as this by 1986, GM had very poor paint durability during this period. Pretty much all of the American manufacturers had bad paint at this point in time, mostly due to more stringent air pollution regulations which resulted in reformulated paints that turned out to be not as durable as the older, more polluting paints. There’s one of these in my town, also in the driveway is a Mercedes 190E. 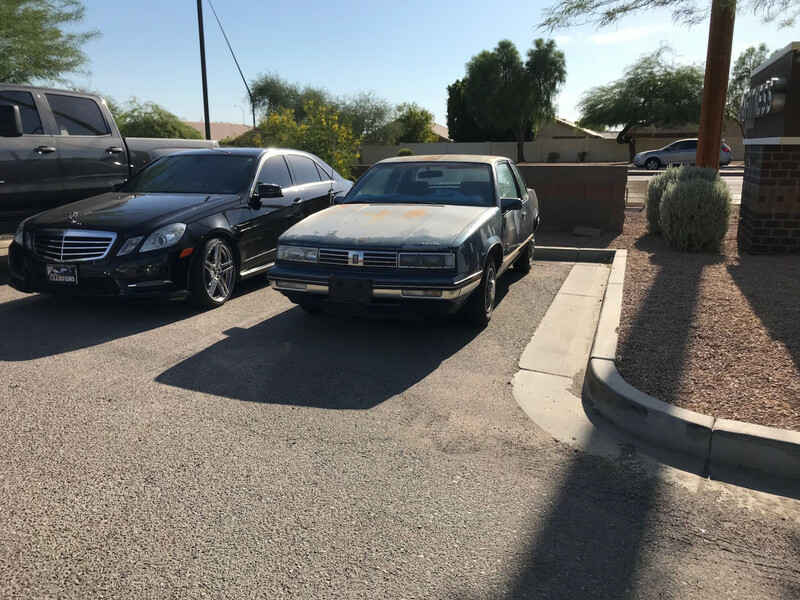 As to the N-body, in retrospect, it’s strange that GM was able to turn over so much of its lineup to FWD during 1980-84, then remained so stuck in engineering and styling thereafter. Good job on the article! The surroundings in the pictures also look really familiar to me. Of course, it could be anywhere in suburban Phoenix, but it looks to me like the LA Fitness around the corner from where I used to live in Tempe, before I moved out of state years ago. The paint condition also looks very familiar to me. In the 90’s/2000’s when I lived there, cars with “sun enhanced” finishes were very common as lots of cars from the 80’s and 90’s didn’t deal well with excess UV rays. Even though cars generally hold up better now and I live in a cloudier place, I still do everything I can to keep my cars in shade. I’ll park in the outer reaches of parking lots to get a little tree or building shade if I can. And my garage is used for car parking, not storage. There’s not much good to say about N-cars IMO. They didn’t live up to the standards of their predecessors or their contemporary competition. Y’all are beating up on this car a little harder than it deserves. First of all, regarding the peeling paint: A LOT of manufacturers were affected by this, and not JUST the domestics. GM, Ford, Chrysler, Honda- all of the ’94-97 Accords I’ve ever seen were that dark greenish colour and all the ’94-97 Accords I’ve ever seen in Atlanta had peeling paint/clearcoat. GM put some bad parts into cars knowingly but this wasn’t one of them. 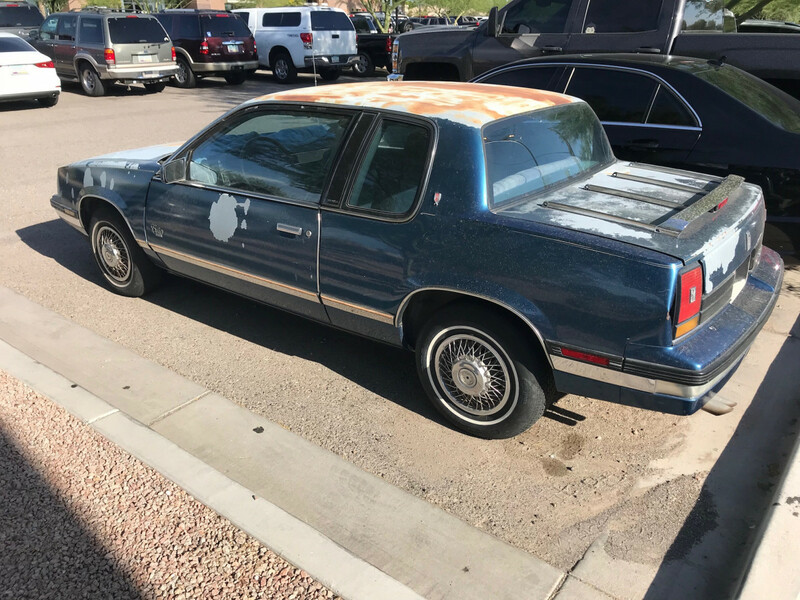 Arizona sun is brutal on car finishes, and it’s a 31 year old economy compact. As the writer stated, the interior is still in great shape, and it’s still going, which is pretty remarkable. For the car itself, as a new car, it presented a compelling argument. It was handier and more compact and less dowdy than its A body showroom competition. It was plusher and better trimmed and more “grown up” than its J body showroom competition, and much nicer to drive and ride in than the Ford Tempaz or Chrysler K cars. The formal roofline made the back seat comfortable for two adults, three if they were teenagers and didn’t mind being close, and a reasonably sized, well finished, easy to access trunk. They were much more durable than their X predecessors and gave excellent fuel economy. The Grand Am was an attractive blend of sporty and a good size and a grown up, but not too mature feeling, and appealed to yuppies and teenagers alike. A Camry was what mom drove and hadn’t yet become the massive hit in 1987 that it soon would; an Accord was popular but still smallish and quite expensive compared with the Calais. Toyota and Honda dealers, until the mid 2000’s (in my experience) had the take-it-or-leave-it, we have waiting lists for our cars attitude and you got much better treatment at the Oldsmobile dealer than at the Honda or Toyota dealer. The Accord wasn’t even fuel injected across all models until 1987 or 1988. The Integra sold 54,757 in 1987. 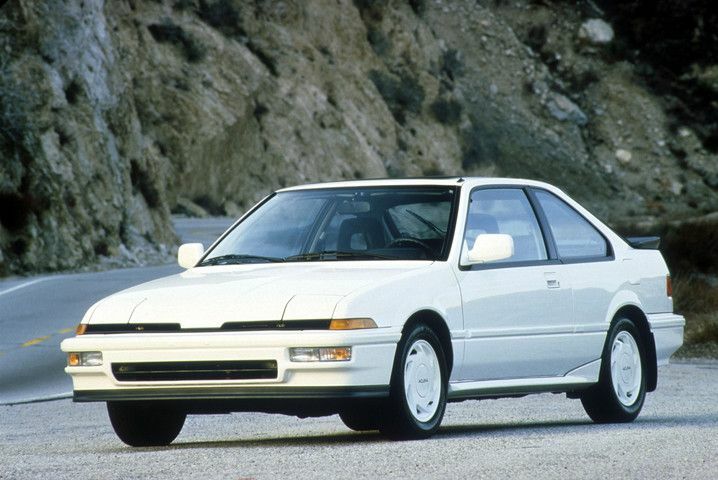 The Calais sold – – well, I cannot find numbers, but I’m guessing that the Calais handily outsold the Integra. The Integra was sportier, but the Oldsmobile was plusher, more comfortable, and probably offered at a better price. Preludes had no functional back seat; an Integra had a sort of back seat, but you wouldn’t want to put people you liked very much back there. The combination of formal luxury cues and sporty cues came from the car the Calais/Somerset/Grand Am were intended to replace, as has been remarked upon; the G body. The G body was available in any number of trim configurations, from Avis stripper special with crank windows and low powered 3.8 v6 to the quickest production car in 1987 in the Grand National to junior Cadillac with button tufted seats and electric everything in a Cutlass Supreme Brougham/Regal Limited. Therefore, it made sense to offer the Calais/Somerset in those configurations. It’s not a design that might make sense in 2018, although who knows? No one’s offering a compact sedan/CUV with wire wheels and velour interior and it might be a smash hit, but you’re looking at a 1987 car through 2018 eyes. The compact size and sightlines made them popular for Grandma who was trading in for something more manageable than a RWD Delta 88 and didn’t need quite that much space now. The N Bodies did not sell poorly, the Grand Am, as mentioned, far exceeded expectations. My guess would be that it hit a sweet spot in Pontiac showrooms for people who could afford to do a little better than the Sunbird and rejected a 6000 as being too dowdy. The Century/Ciera were better poised to capture Olds and Buick buyers who were willing to move up slightly to the Century/Ciera so the Somerset and Calais didn’t do that well. As the original writer stated, these were generally yuppie cars, for the young upwardly mobile professional, the first car you got on graduating college or at a midpoint in your career and pretty quickly traded in for the next level once you upwardly moved. Then they quickly were relegated to a teenager’s first car and suffered short but frequently exciting lives. The Calais and Somerset each launched at well over 100K per year, on top of about 50K J bodies. The take rate on step up models was decent. At the end, the Calais and Skylark were the bottom of the line and sold 80K–90K per year, mostly base models. As a foreigner I don’t think I’ll ever get the concept of a formal luxury 2 door car. Particularly a small formal luxury 2-door. It just doesn’t happen in Australia. 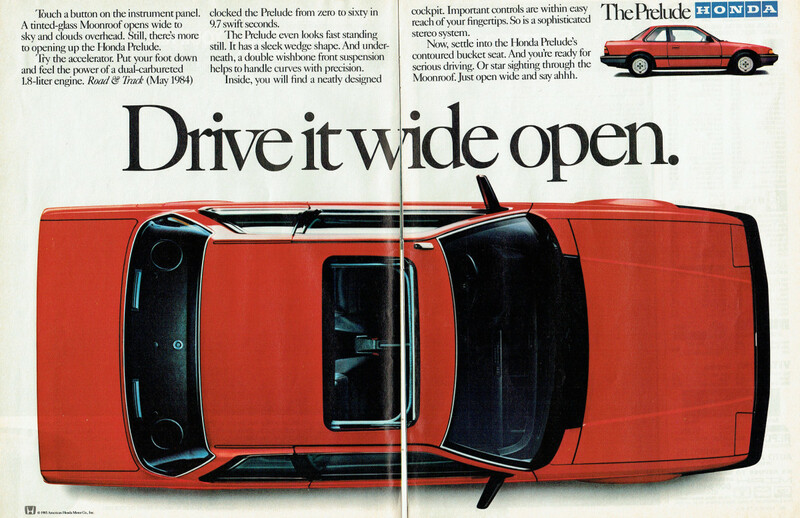 That being said, I was fascinated to see the Honda Prelude ad as the second picture, and to compare how gawky, mis-proportioned and malformed the Olds looked compared to a very average-looking Honda. But we’ve lamented the styling miscues GM made during this period quite enough. I’d just take the trunk lid off and use it as a short-bed extended-cab pickup. The paint looks right for that…. These GM efforts are just horrendously ugly, two door luxury coupes should be designed by sighted people only. My ex’s mother was given one by her husband who traded a nice 80s Caprice waggon for a loaded one. She drove it about a week and hated it and she took over his Cutlass supreme brougham sedan and he got stuck with it. 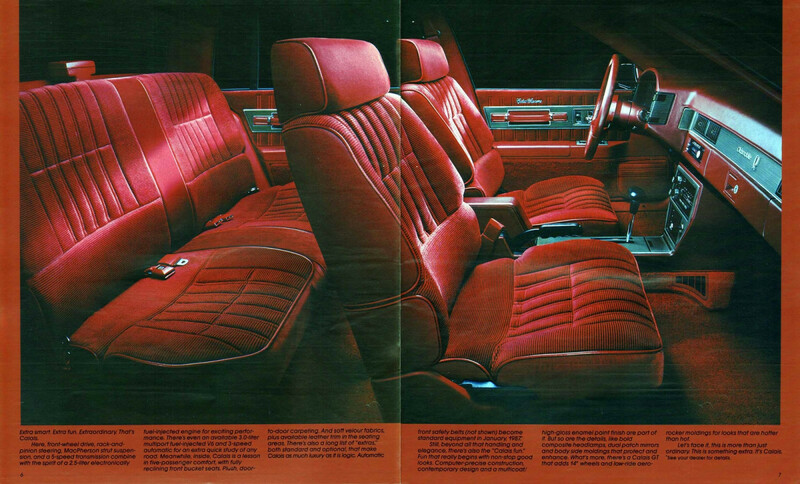 It was that maroon red olds color that looked great new and had velour brougham seats and power everything. It rode poorly and was crampped. No head room or leg room in back and in the front the wheel wells protruded into where your feet go. She was a big angry woman, a former opera star. I referred to her as the queen of the night. It was way too small of a car for her. So her husband got stuck with it. It faded quickly and I believe it had head issues with the quad 4 prematurely and it had axles and electrical issues. A couple years later it got replaced with a big LeSabre collectors edition which the queen of the night took over. That car suited her better. The picture just above the white Integra, taken from the left rear – if you cover up the tail lights the Calais looks exactly like a similar vintage Eldorado. The wire wheels and the shape of the wheel well cutouts just say Eldorado to me. I know it’s been commented before many times on the similarity of the N and E bodies, but this is the first time I could mistake one for the other easily. It’s been an Arizona car for many years, as the first letter on the license plate is “K.” Although my memory is fuzzy, I think the “K” appeared in 1992-1994. I’m also curious as to where this was found.